What is a gear reduction? It's a mounting assembly for the 5 KW and 10 KW sailboat kit motors (will also work with most NemaC face motors). It's thrust protection to isolate the motor from axial propeller forces. 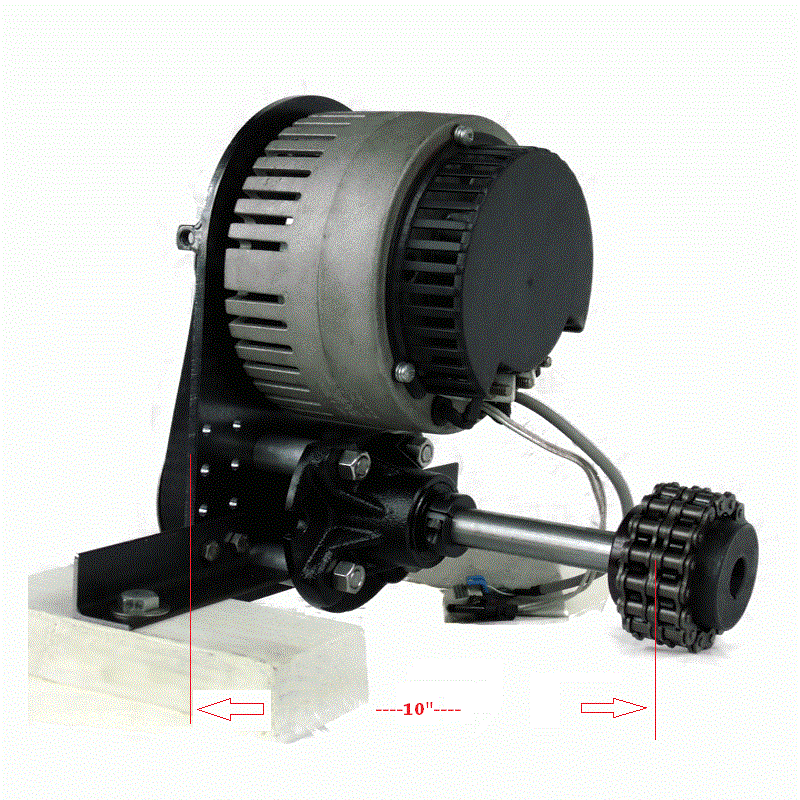 It's a speed reducer/ torque multiplier to prevent cavitation. It includes a shaft coupler to attach to your existing prop shaft. Now with a Stainless Steel Plate! 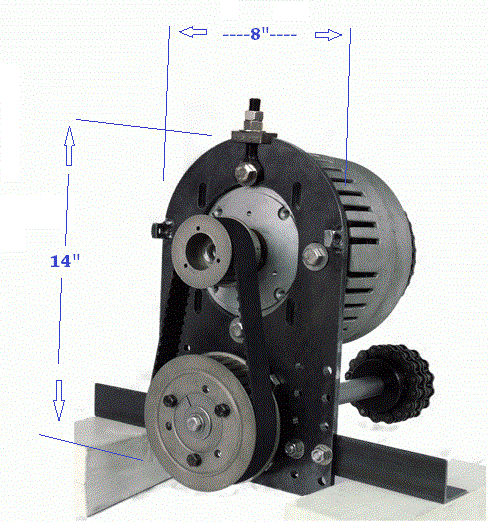 The ThunderStruck Gear Reduction comes standard with a 2:1 gear reduction pulley set mounted on a 1" drive shaft. The stainless steel plate is 1/4" thick, paintable, and has multiple mounting holes to make aligning your gear reduction easier. Also now comes with belt tensioner! The side supports are easily adjusted by being cut down to the proper size for your application. Top mounting holes can be used for additional triangulated support and alignment. Our gear reduction also includes a shaft coupler composed of a double roller chain sprocket set which allows for flexibility (1" coupler is standard, others sizes are available). 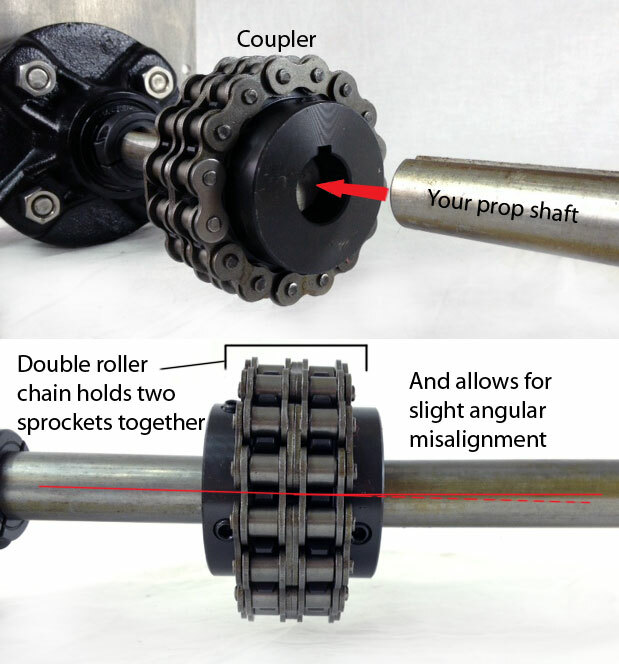 One sprocket is mounted on the gear reduction shaft, and the other is mounted on your existing prop shaft. They are joined with a double roller chain as seen in the photo. Motors are sold separately. Do I need a gear reduction? If you choose not to use a gear reduction, it's important to install a thrust bearing somewhere in line with the prop shaft, as most motors are not rated for axial/thrust loads on the shaft. If you Do pull your old engine, it's good to support the prop shaft where it's at now so you can properly align a new system.